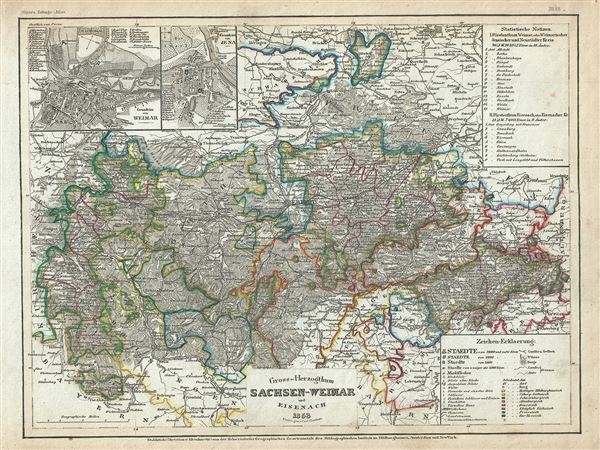 This is a scarce 1852 map by Joseph Meyer, depicting the Grand Duchy of Saxe-Weimar-Eisenach, part of the modern day German state of Thuringia. It covers the region from Allstedt to Hildburghausen and from Waldkappel east as far Gera. Throughout the map identifies various cities, towns, rivers and an assortment of additional topographical details. Two insets in the top left quadrant of the map detail the cities of Weimar and Jena. The Grand Duchy of Saxe-Weimar-Eisenach or as it was later called, the Grand Duchy of Saxony, was created by the Congress of Vienna in 1815 by raising the status of the previously merged duchies of Saxe-Weimar and Saxe- Eisenach. It would remain a Grand Duchy until the German Revolution of 1918, after which became part of the new state of Thuringia. This map was issued as plate no. 25 in Meyer's Zeitung Atlas. Although all the maps in this atlas are not individually dated, the title page and maps were often updated while the imprint with the date was not, causing confusion to the exact date for some of the maps. Moreover some maps in the atlas were taped in at a later date as an update to the atlas. We have dated the maps in this collection to the best of our ability.